The Young Hegelians were a group of radical leftist philosophers who worked in Hegelian philosophy. Many of them were extreme atheists and socialists, who believed that the Hegelian dialectic would result in a profoundly different society than the one they were currently in. Most of them were ostracized or exiled from Germany as a result. In his personal life, Marx was extremely poor at his own finances, and largely depended on Engels for money. He apparently would go on pub crawls where he had one beer at each bar on his street (there were twenty three bars), and would chain smoke and eat poorly. Engels would typically bail him out when he got into any financial trouble (Engels' father was a wealthy textile manufacturer), and even gave him a sort of a monthly pension later in life. 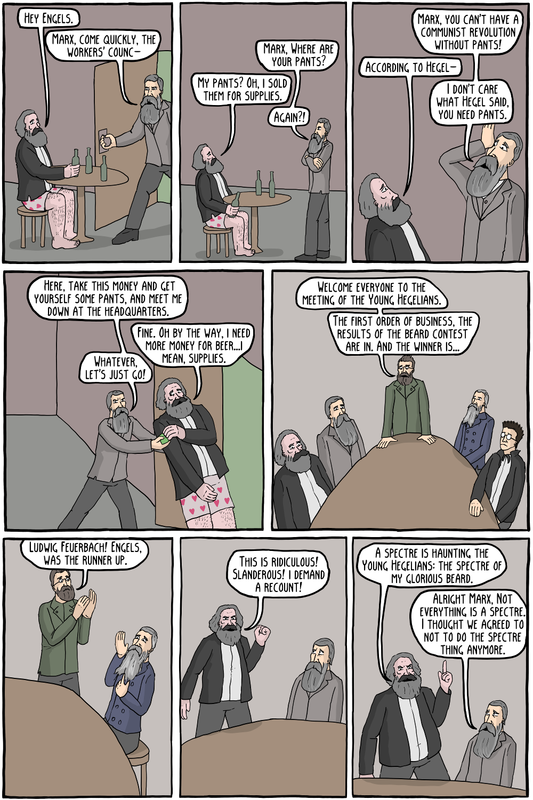 Apparently Marx literally did pawn off a lot of his possessions many times, including his only pair of pants, so he wouldn't be able to leave the house until he got them back. How he got them back is a bit of a mystery, and I haven't been able to verify this story, but Existential Comics has its own theory of epistemology - if it is that funny then it must be true. Max Stirner was a radical nominalist, believing that nothing exists but the concrete. What he meant by this is that abstract categories and ideas don't properly exist, and shouldn't be considered when deciding on how we live our lives. So, for example, the idea of "religion" is an abstract idea, and can't have any impact on our real immediate lives. Similarly, ideas like socialism or communism were abstract and utopian for Stirner, and he thought an individual should never devote his life to abstractions (he would rather colorfully call them "spooks"). He thought we shouldn't be devoted to anything aside from our own individual concrete existences. Marx and Engels were strongly against Stirner's nominalism and anarchism, and wrote a large rebuttal of The Ego and Its Own. In fact the rebuttal was longer than the original work. They considered that kind of individualism and anarchism to be a threat to the goals of communism. The Young Hegelians, and particularly the Dialectical Materialists, were best known for having the top 3-4 beards in the history of philosophy. 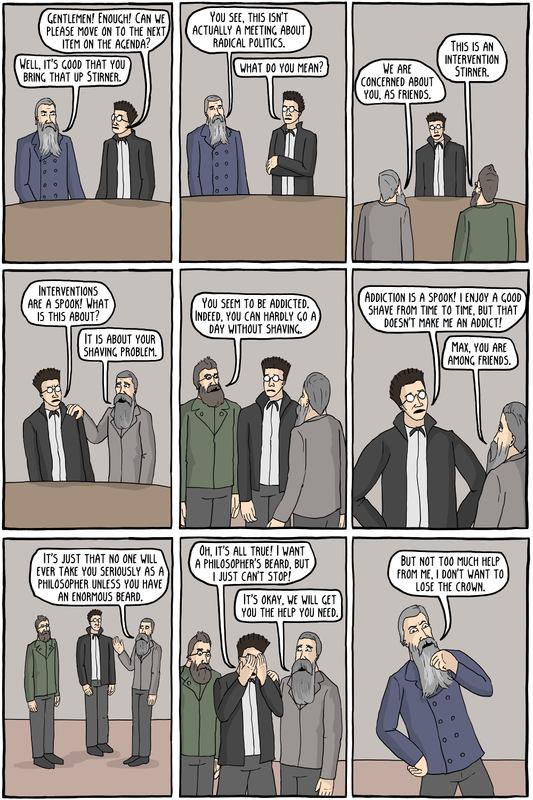 Seriously, look up the pictures of Marx, Engels, and Feuerbach. Glorious. Also, this might be a good time to check out the Wikipedia section on the Philosopher's Beard.